Saturday March 17th 1883 I felt a little better than yesterday and was up all though Bridget did most of the work. Aunt Mary was here all the afternoon we had a very pleasant visit with her. I sewed a little in the afternoon went to bed early in the evening. Sunday March 18th 1883 I worked in the kitchen all the forenoon doing some baking Bridget did the work up stairs. I wrote a long letter to Otto in the afternoon. John and Hatt were over to supper. I read in the evening. 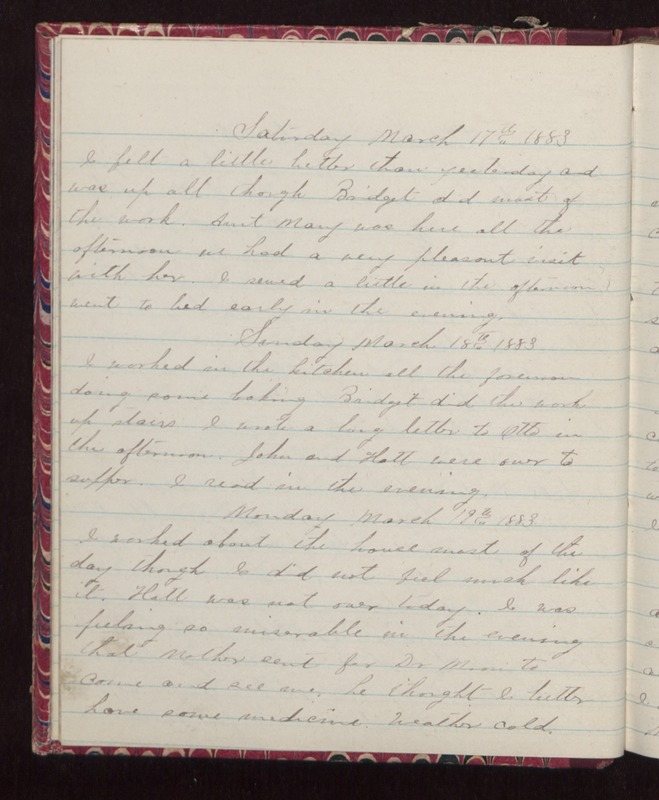 Monday March 19th 1883 I worked about the house most of the day though I did not feel much like it. Hatt was not over today. I was feeling so miserable in the evening that Mother sent for Dr Moon to come and see me, he thought I better have some medicine. Weather cold.